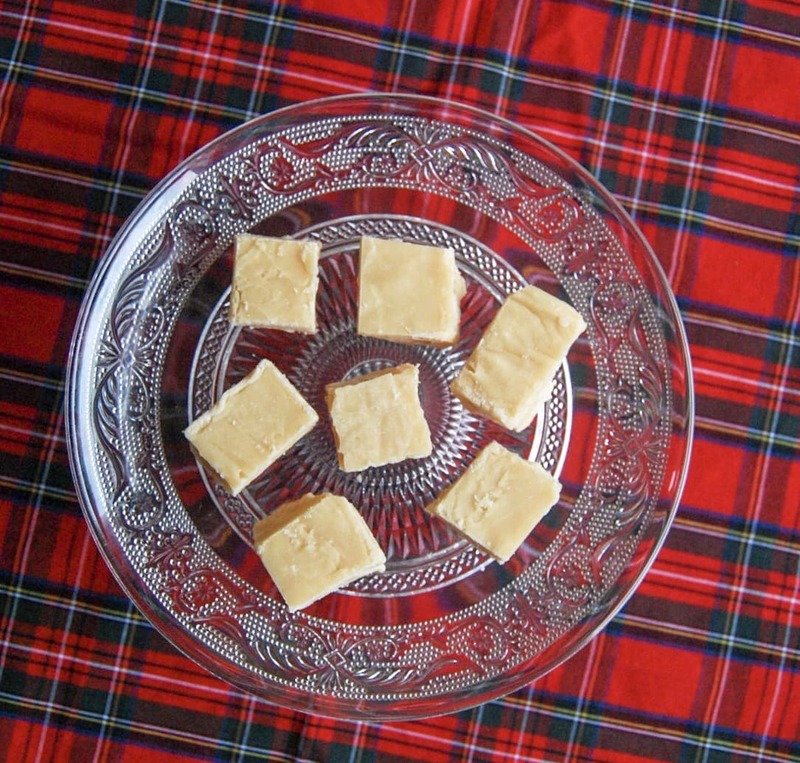 Learn how to make traditional Scottish tablet with my step by step instructions! Tablet is the sweetie of my childhood – one bite and I’m instantly reminded of the “sweetie lady” – a lovely woman who used to go around houses selling her home made tablet and fudge. It was the stuff sweet dreams are made of. Tooth achingly sweet, slightly grainy texture but melted in your mouth. Sadly I never got to find out the lady’s name, so her identity remains a mystery. For years I tried (in vain) to re-create the sweetie lady’s tablet using various different recipes, but all I ended up with was numerous burnt pans of sugar. But I persevered and this is the result. The number one thing to remember when making tablet – it needs your full attention. If the phone rings, don’t answer it. I wouldn’t recommend stirring while catching up on your Facebook/Instagram feed either – it only takes one second to ruin the whole batch! 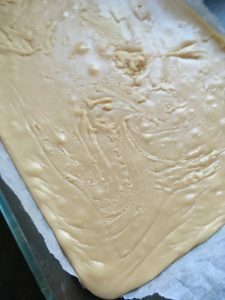 HOW TO MAKE TRADITIONAL SCOTTISH TABLET…. STEP ONE: Melt the butter, sugar and milk over a low heat in a large, heavy bottomed saucepan. STEP TWO: When the mixture has completely melted and there are no grains of sugar remaining, add the condensed milk and slowly bring to the boil, stirring all the time. The mixture will start to bubble quite furiously and that’s fine, as long as you keep stirring so it doesn’t catch on the bottom of the pan. If you have a sugar thermometer, by all means use it – it takes the guess work out of when you need to take the mixture off the heat! The setting point for tablet is 120C. If you don’t have a thermometer, then you can drop a piece of the mixture in a glass of cold water – if it sticks together and forms into a ball shape, then it’s ready. Do bear in mind that it can take about 15-20 minutes for the tablet to reach the correct temperature. As soon as the mixture has thickened, pour it into a greased and lined tin measuring 9×11 inches. I always use a Pyrex dish. Then all you need to do is leave it to set a little (about 20-30 minutes) before scoring into squares with a sharp knife. You don’t have to do this, but if you wait until the tablet sets completely until cutting the tablet will shatter and you won’t get nice neat squares. So that’s how you make the perfect tablet – it’s not difficult but it does demand your full attention! However, the end result is totally worth it. Following my instructions will give you gorgeous tablet that melts in your mouth. If you make my tablet recipe, I would love it if you shared a picture on my Facebook or Instagram page. Alternatively if you have any questions, please leave me a comment below! 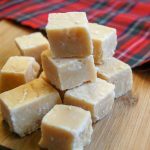 Looking for more Scottish recipes? This post was originally published 25th January, 2015. Republished 19th January 2019 with new photographs and step by step instructions. 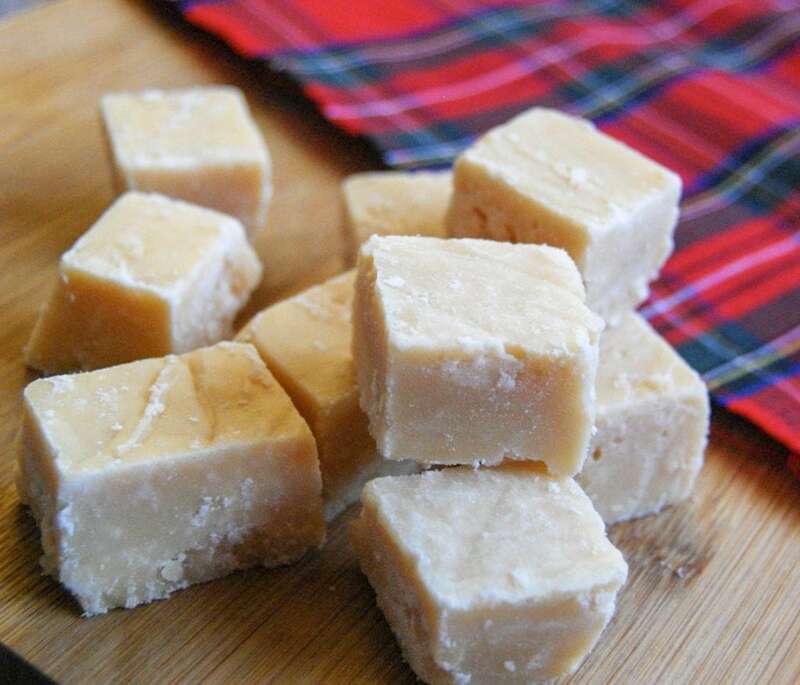 An easy recipe for Scottish tablet - an old fashioned, crumbly sweet treat! Melt the butter in a large, heavy based pan over a low heat. Tip in the sugar and milk and keeping the heat low, allow the sugar to dissolve, stirring occasionally. 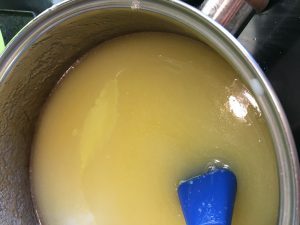 When everything has melted together and there are absolutely no grains of sugar left, add the condensed milk and slowly bring to the boil, stirring constantly. If you have a sugar thermometer, the setting point is 120c. Otherwise, keep a cup of cold water by the side of the hob. To test the tablet, drop a small piece into the water. If it forms into a soft ball, it's ready. 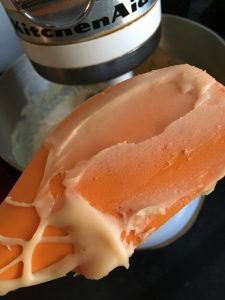 Now for the part where you'll need a bitof muscle - take off the heat, stir in the vanilla extract and beat vigorously for about ten minutes, or until the tablet is thicker and slightly grainy in texture. I've heard of some people using a mixer for this step which would save you from getting sore and tired arms! Tip into the lined tin and smooth out as best as you can. I find a silicone spatula is best here. Leave to set and cut into small squares. Hi you forgot to mention when to add the butter you also left out syrup which means Scottish tablet won’t be grainey my gran was Scottish champion at making tablet. I could probably eat an artery-clogging amount of this! Do you have your granny’s recipe. It sounds like the one my mum used to make …. she always added Golden Syrup. Thanks. Hi Wilma, I’ve never tried adding syrup to tablet before – sounds interesting! Hi Wilma, I’ve never tried adding syrup to tablet before – sounds interesting! I’ll need to try that next time. I sometimes make it with soft dark brown sugar or soft light brown. Yummy. I also use a handheld blender instead of a wooden spoon to beat at the end. i was just thinking that lol.. it would be easier..
Wlima are you substatueing the sugar? or adding syurp also and how much do you add ??? 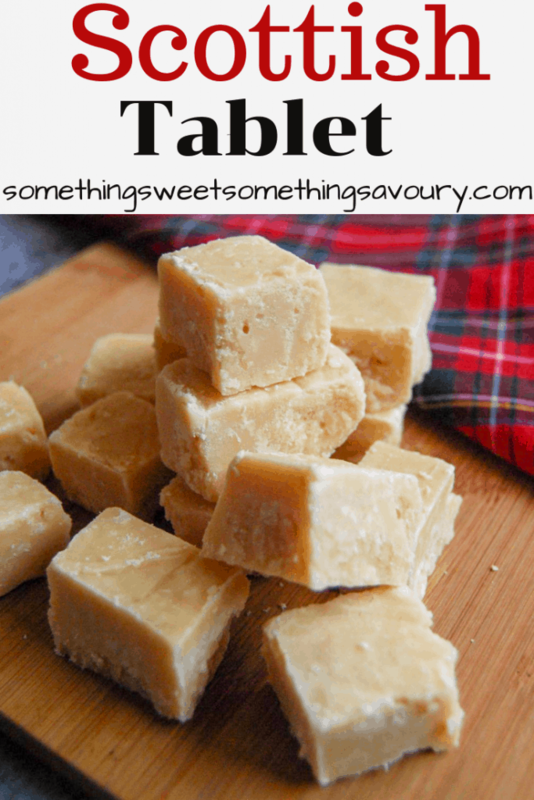 You know after living in Scotland for more than 20 years I have still never made a proper tablet, I really need to give this a try! Thanks for sharing. What a treat! 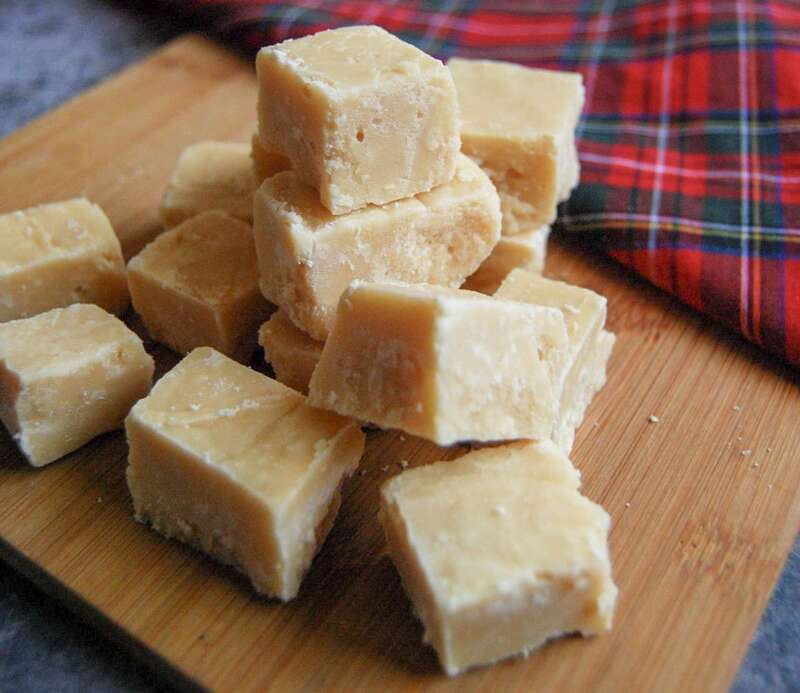 I’ve never made Scottish tablet but I have eaten quite a lot of it in the past. Thanks Corina ? I don’t make it very often because I can’t control myself around it! You should definitely give it a try! Thanks Michelle ?